In a recent gig review I described the four Cornshed Sisters as looking like Primary School teachers with a twinkle in their eyes their debut album confirms that portrayal. The album TELL TALES has taken some recording, as the ladies in question all hold down day jobs meaning time is of the essence when it comes to recording and performing; but the wait is well worth it. Normally I’m no lover of English folk music but TELL TALES owes a lot more to Crosby, Still and Nash than it does to Steeleye Spam. 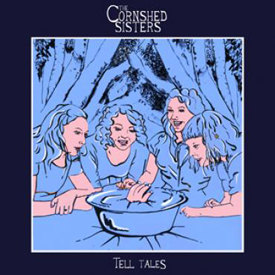 Each of the Cornshed Sisters get to take turns as lead vocalists with no one being any better than the others, as they are all wonderful and wonderful only comes close to describing the harmonies that fill each song like mercury in a silk glove. Opening song Dresden is an incredibly clever and enchanting cover song that sounds absolutely nothing like the original by Les Cox Sportifs; it may be a little bit in bad taste as they use the carpet bombing of Dresden, Germany in WWII as a metaphor for how much the singer loves their lover; but if you get past that, it’s a beautifully powerful love song in the best Folk tradition. Recent single Dance At My Wedding has justifiably been receiving radio play on a few National BBC shows and could be the lever to get them onto the big stages of this years Festival circuit. Another intelligent but catchy song is If You Were Mine which has a simple piano and shaker accompaniment and should also attract Radio attention if there is any sense among the people who compile playlists. My favourite song though; is Pies For the Fair which has a sweet and even childlike Northumbrian Folk feel to it; until you realise the woman making Pies For the Fair has accidentally used meat from someone dressed as a fancy dress rabbit! It’s hilarious and also a guaranteed showstopper. Each song is enchanting in its own right and when you listen to the whole album in one sitting (which I heartily recommend) it’s like watching the sun set over the Cotswolds while supping the finest beer and holding the hand of the one you love.